I'm late for work, but here's a quick shot of the kitchen light. Tim got it put up last night. I wasted all that time worrying that it would look stupid with the painted copper ceiling. I was wrong, it looks great! Thazt looks nice. Is that a wood ceiling? 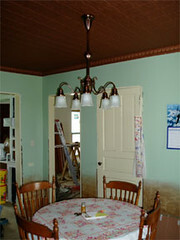 No, the ceiling is a new "old" tin ceililng painted with copper paint.